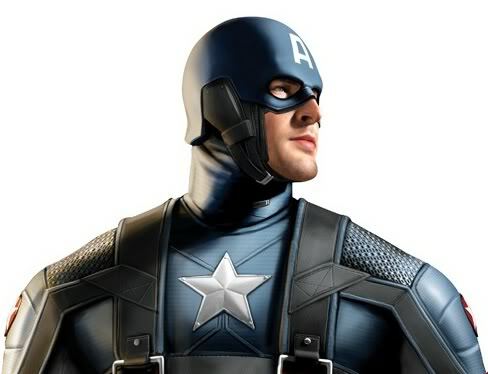 Cap's costume looks like it was made with modern materials & not in the '40's like it should. Now, if this is the Modern Costume for Cap, (i.e. after being frozen & thawed), my point is moot. yeah that was the thing that irked me most, though I know it probably doesnt fit with the era of WWII or the modern day kind of update either. Well, Thor's supposed to be from an even OLDER time. Norse mythology. i don't know what time period the THOR movie is set in, but if it's modern times, the costume reflects that. also, no pelt's for capes like that Incredible Hulk TV movie Thor. if however, Thor was wearing this outfit and the movie's time period was set around 700AD - 800AD, then there'd be a problem. I think KB is using costume designs from the recent Thor comics rather than the 60's. The top 3/4s is pretty comic accurate from what I remember. I'd prefer to see a different set of boots but I'm not going to get in a frenzy over it. That cap costume looks pretty close to ultimate cap's, thor's looks like a mash up of his modern costume with one of the left over x-men movie costumes, really wish they just went all modern costume with thor! here's a quick photoshop job painting wings on Cap's noggin. but even that looks better than none. That linked picture is absolute WIN. As a Cap fan I'd love to see a 100% comic accurate costume but I'm not sure if the wings would work. Making the switch from a cowl to a helmet makes sense. Why send your poster boy into the battlefield without decent head protection? I think we're only going to see the round shield in the movie and I find it highly unlikely that a poster for a major super-hero movie would have a dead body fairly prominently featured. So, I'm guessing fake. Everything except for the dead body (bodies?) is pretty cool though. Yeesh! Chris Evans has really let himself go. They should have gone with his younger (but nearly identical) brother Scott Evans. Costume looks a little rough and ugly up-close, but since it's just a stunt-double and clearly only intended to be seen in action or from far-away, it looks pretty good. Very glad to see the "wings" on his helmet. Looks like crap. Hopefully this is some sort of prologue to the actual film. Xenaphobia wrote: Costume looks a little rough and ugly up-close, but since it's just a stunt-double and clearly only intended to be seen in action or from far-away, it looks pretty good. Very glad to see the "wings" on his helmet. Looks good to me so far, and I too am loving the wings (which was the one key thing I was hoping they'd add to it by production ).